For the first of our Power to the Mother series, I interview Eloise Rickman, of Frida Be Mighty. 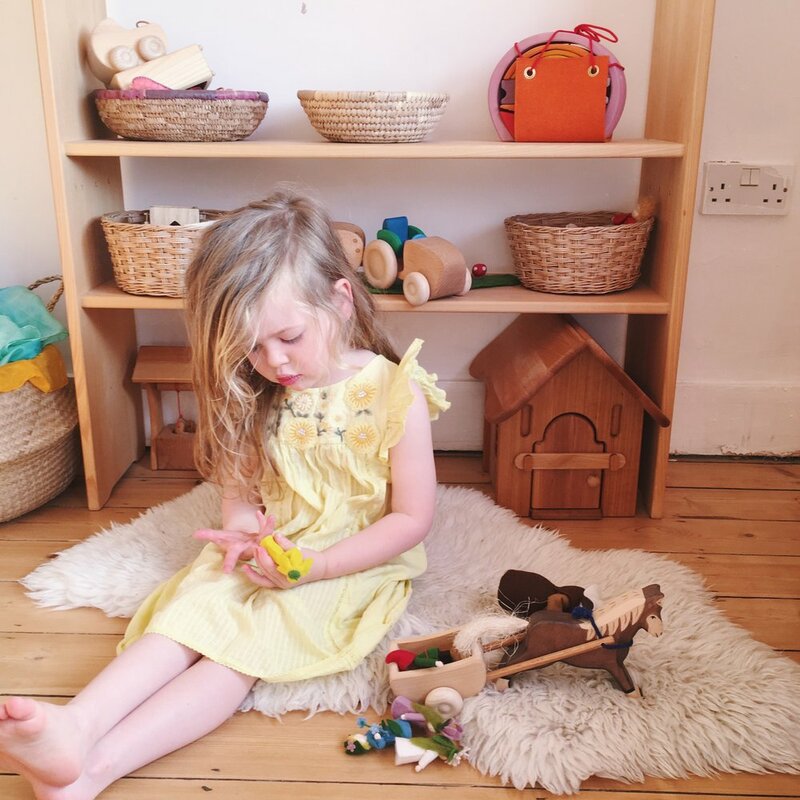 Eloise has been hugely influential on my journey as a mother, particularly in the ways we choose to educate and parent our daughter, and I just love her courses. She has such a refreshing, kind and inclusive voice, so I was really looking forward to getting to know more about her experiences of birth and new motherhood. 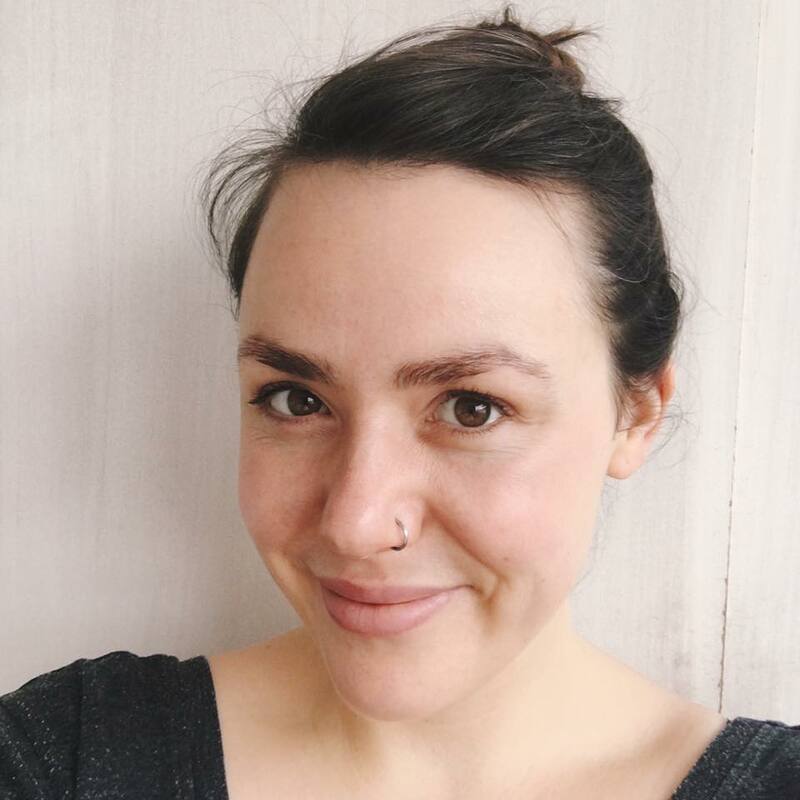 Here she is on having the birth you might not have planned for, training as a doula and hypnobirth teacher, friendships, and being present. I hope you enjoy her answers as much as I did. I'm Eloise, a writer, parent educator, and peaceful parenting coach. I live with my husband Sam, our young daughter Frida, and our ginger cat Albie in a bright house full of books in south London. We are currently home educating Frida. What was your experience of pregnancy? How did you prepare yourself in that time? What were your feelings on birth leading up to it? When it came to birth, I was excited. I read everything I could get my hands on about positive birth, practiced hypnobirthing, went to NCT (my husband still teases me for the fact I was an insufferable know-it-all during our NCT classes), booked a home birth, the works. My view has always been that knowledge is power, and I wanted to be sure that I did all the research I could ahead of time so that if we needed to take a decision during labour we would be able to do so from a place of being informed. I found pregnancy a mix! Visions of myself as a glowing beauty who only put weight on on her perfect bump were quickly erased by feelings of intense sickness (and eating of toast), a constant craving for sweets, and a few annoying aches and pains. However, despite the physical niggles the physical act of growing a person was bloody incredible. I remember feeling so lucky that it was me and not my husband who got to do it! I felt very attached to our daughter from early on in the pregnancy, and loved feeling her wriggle and dance and kick. It was magical. I should probably say that since having Frida I have been pregnant a number of times, all of which ended in loss. Those pregnancies were very different experiences, but that is probably a story for another day! Can you give us your birth story? It all started on a Tuesday morning. My husband was getting ready for work, I was 39 weeks pregnant and on maternity leave, preparing for the birth of our baby. As I got out of bed I felt a trickle of warm liquid run down my leg. I called down to my husband that I thought my waters had broken. As I didn't feel anything else I urged him to go into work as planned to tie up loose ends, with the promise that I would call him home if I felt our baby was close to making a appearance. I delayed calling my wonderful local midwife team (I was planning a home birth) as I knew that there would be a "clock" which would start as soon as I mentioned that my membranes had ruptured. Instead I walked around our new neighbourhood. I bought fresh flowers to arrange close to the birthing pool we had set up in our dining room, and went to the supermarket to stock the fridge and cupboards - everyone knows midwives like tea and biscuits. I called the midwife at midday and told her that my waters were leaking and that I was starting to feel mild and irregular surges. A dear friend came to keep me company, and we drank tea and chatted as I bounced on my birthing ball. My midwife popped in and listened in to the baby, reassuring me that all was well. My husband came home and we went to bed excited, wondering if we would meet our baby that night. I was still having irregular surges but they felt perfectly manageable as I used my breathing and re-read my birth affirmations. That night and all of Wednesday my waters continued to leak and my surges continued to build up and then fade. My husband and I went for walks in the sunshine together, stopping at each surge for me to breathe slowly and deeply as I leaned on him. I was checked by a midwife, who reminded me that induction of labour was offered 24 hours after rupture of membranes. I declined, telling her I wanted to give my body the chance to go into labour spontaneously. I so wanted my home birth. That night my surges came every ten minutes all night, and with each one I would get out of bed, lean on the windowsill and breathe deeply. I felt the sensations almost uniquely in my back, and found it hard to get comfortable despite being propped up on eight (!) pillows. The next morning, a midwife visited and mentioned my baby was at that time back-to-back (OP). I spoke to my baby, urging her to turn, and adopted various positions to encourage her to move; moving into all fours, walking up and down the stairs sideways, and leaning on my ball. The next night brought no baby, only more surges, more fluid. It was now Friday, 72 hours after my waters had broken. I knew that this placed me "out of guidelines" but I felt confident that my baby was healthy and I wanted to give my body one more chance to have a natural labour. I saw another midwife who told us that the baby was no longer back to back, and suggested we speak with a consultant midwife who specialised in "out of guidelines" births, who could give us more information on what options we had available to us. We were delighted to do so, and she listened to our concerns about the induction process, gave us information and statistics, and stressed that only we could decide if we should go to hospital to start a medical induction. We felt empowered, listened to, and in control of the direction our birth would take. My husband and I spoke about it at length and decided to give my body one more night; if there was no change after 96 hours we would go in. Although the surges were continuing still I slept a bit better knowing that whatever happened I would meet my baby soon. On Saturday we travelled to St Thomas' hospital, at peace with the path our birth was taking and confident that we had made the best decision for me and for our baby. We had given my body time to try and go into labour naturally but now, after almost a hundred hours of early labour, I was exhausted and felt it was time to change course. After a coffee and a read of the Saturday papers in a hip Waterloo cafe we were admitted into hospital, straight into a private room overlooking the Thames. I had my first vaginal examination and was found to have a very low Bishop score (suggesting I was indeed not close to giving birth naturally at that point). I reminded myself that my body was still working hard to prepare to birth my baby; I now believe that during those early days of surges my body was in fact working to help my daughter turn into an optimal birth position. The first stage of induction in the form of Prostaglandin gel was carried out, and I continued to feel beautifully supported by my husband. We listened to the radio, ate snacks, and laughed as much as possible. The worst part was a cannula being placed in my hand, as they couldn't find a line and I was scolded for having weak veins! When I was examined on Saturday night my Bishop score had risen, and I agreed to the syntocinon drip on the condition that I would first be given an epidural. Until then I had managed the days of uncomfortable surges with breathing and some paracetamol but I knew that the drip would likely bring hard, fast and fierce surges which would be too much for me to cope with whilst lying on a bed being monitored, tired from lack of sleep. The epidural allowed me to rest as the drip allowed my body to fully prepare to birth my baby. At 5am on Sunday morning I was examined again and found to be fully dilated. My wonderful midwife suggested I have a snack and rest some more before moving into the second stage of labour. I used this time to allow some of the epidural to wear off so that I could still assume an active position - I knew being on my back would increase my risk of having an instrumental delivery and I really wanted to give birth upright. At 7:10am, with me kneeling over the hospital bed, our daughter Frida was born, with a shock of dark hair and a face I will never forget. My husband tells me that watching her be born is the most beautiful thing he has ever seen. She was, and still is, perfect. The birth I had was not the birth I had hoped for, but it was the birth that was right for us. It was an empowering, elating, amazing experience; the best thing I have ever done. It was most definitely a good birth. In the days, weeks, months - even years after - how did you find new motherhood? Do you feel your experiences shaped you at all? I loved it - I still love it. Becoming a mother felt like coming home, like a layer was being peeled off me to allow me to see myself more fully. It's hard to describe, but it felt like part of me just clicked into place, as though I was always waiting for our daughter to come along and complete me. Of course there were hard bits - the brutal lack of sleep for many months, the profound shift in identity, the complete loss of any time alone or as a couple, the hard decisions about whether I should go back to my old job (pre-motherhood I worked as a senior press officer in a Government department; I didn't go back). But becoming a mother was everything I wanted and more. I am so profoundly grateful for it. What was the thing you found the most difficult or surprising? I think for me one of the things I have found hardest is the change in my pre-motherhood friendships. I haven't spoken about this much, and it still feels like a raw subject for me. I don't think I was prepared for the shift which I would experience, and how desperately I would miss some of my close friends. I guess it's understandable - I was a mother, they weren't (we were the first of our friends to have a baby) and for the first 18 months of Frida's life I was still breastfeeding overnight which meant late nights out with friends were not on the cards. I suppose that when you keep turning down invitations, you eventually stop getting invited out. But it meant that once Frida was less reliant on me and I had more flexibility to meet up, I felt forgotten about. I have made some amazing new friends since becoming a mother, but although they are awesome I have still felt real intense sadness at how some of my friendships didn't evolve quite how I had assumed they would. Since having Frida you have trained as both a doula and hypnobirthing teacher, how did this change your perspective? I'm not sure that either necessarily changed my perspective on birth, as I was already pretty well-read on positive and empowered birth. But they both certainly changed me! My Hypnobirthing training taught me a lot about mindset and the science behind visualising, using affirmations, and positive mindset work, all of which I still use now both personally and with my clients. And my doula training taught me a lot about empathy, about supporting each woman where she is at right now, about holding space and truly listening, and about letting go of judgements and preconceptions. It also taught me the power of getting a group of mothers together and giving them space to share and talk and laugh and cry. Find like-minded mothers to share your birth and parenting journey with. I found a group of incredible women via Mumsnet who were a lifeline during those early days (many of us are still in touch now), and one of my NCT group was thankfully able to look past my annoying questions about physiological vs managed third stages and is now one of my absolute best friends. Further on, whatever your parenting style, finding a community of parents who share your parenting values and can provide you with support when things feel hard is a must. Bonus advice: Get a really great sling or infant carrier. Not a BabyBjorn. It will make your baby happier, free up your hands to eat cake, and generally save your sanity. It's the best thing you can spend your money on! Then when your baby grows out of it, sell it and buy a toddler one. What have you found empowering in motherhood? So much! I have found motherhood a pretty empowering experience. Growing a person, giving birth to them, and then feeding them for years from my body was pretty damn empowering. Suddenly having to be the adult, advocate on someone else's behalf, and make informed choices regarding how to raise this small person that has been entrusted to me all felt (still feel!) both empowering and slightly terrifying. I have also learned to really trust my instincts. Since becoming a mother I have started my own business - something I never thought I would do - which has been a hugely empowering experience and has pushed me to grow in all sorts of ways. I also have stronger boundaries now; I'm better at saying no to the things that won't serve me or our family, even if it's still something I find hard to do. I try and get up early before my daughter wakes up to meditate, breathe, journal, and just be for a while before the day begins. I also try and focus on really being present for a few moments throughout the day - feeling the softness of my daughter's hand in mine as we cross the road, taking a minute to drink tea in the garden and feel the cold wind on my face and the hot mug in my hand, really watching the sun dance on the leaves of a tree. These small moments don't cost anything but they bring me so much. You can find Eloise at Frida Be Mighty, on instagram as @mightymother_, and in her Facebook group A Beautiful Childhood.